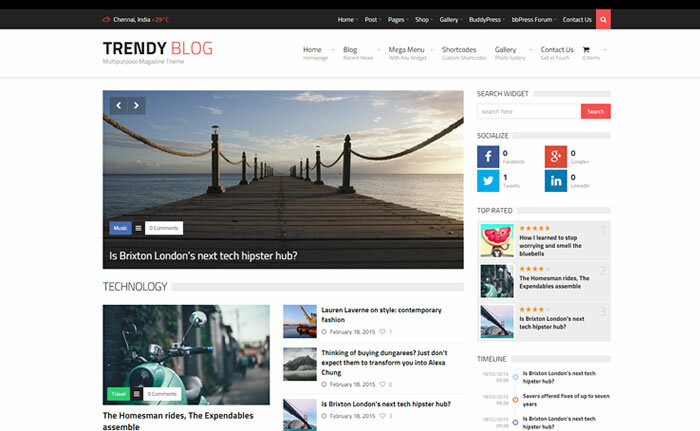 TrendyBlog is light and minimal blogging / magazine WordPress theme suitable for news, editorial, magazine, personal, review and blogging websites. Trendyblog has 5 feature rich home page layouts or built your own unique custom home page layout with available blocks included with the theme. TrendyBlog has built-in advertisement management system which will helps you to add images, text, videos or any HTML code to rotate the advertisements with some advanced settings. TrendyBlog is WooCommerce ready blogging / magazine WordPress theme integrated with sidebar manager, shortcodes, ajaxified gallery templates and its fully compatible with WPML multilingual WordPress plugin helps you to translate website in any languages to gain more audiences across the world. TrendyBlog enabled to support mega menu navigation and creating discussion forum or running your own social networking community with your WordPress website is so easy now by using bbPress and Buddypress WordPress plugins. Loaded with 10 custom widgets, 3 category templates, custom 404 error page, Google search snippets, 600+ google web fonts, 400+ fontawesome icon fonts, 1 click demo site builder and much more.